The day started for us at 3:30 AM at Ben Gurion Airport. We boarded the flight as scheduled at 5:50 AM and landing in Venice, Italy at 8:45 AM. Upon departing the airport in Venice we hopped onto our private water taxi that took us to the door of our Hotel, Locanda la Corte. A very quaint guest house located in the heart of Venice. It felt like the middle of the day so we decided to grab some fresh Pizza before starting our touring. 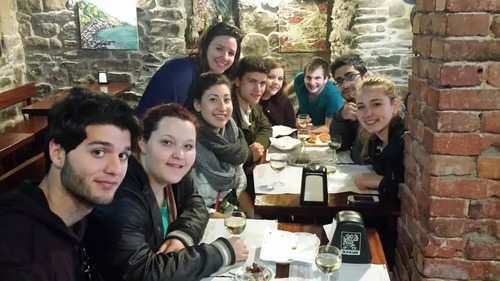 We found a small pizza store and enjoyed fresh Italian Pizza on the stairs of one of the many bridges in town. After enjoying some sun we started wondering around the city and taking in the beauty of Venice. We tried on Venetian Masks, admired Moreno Glass and enjoyed gelato. Early afternoon we met with our tour guide Feredica, who took us on a walking and boat tour throughout the city. Feredica took us through the quiet backstreets of Castello, one of the most beautiful local neighborhoods in Venice. Followed by a visit to St Mark’s Square and visit St Mark’s Basilica. After seeing the view of Venice from the top of St. Mark’s Basilica we took a private water-taxi to see the Grand Canal and also some smaller canals at sunset. After the three hour tour with Feredica we acted like locals and went out for a spritz, the classic Venice afternoon drink. Followed by some much needed rest before our evening dinner theater. Our activity tonight was Teatro Del Gallo, a short play about the history of Venice with the use of masks. The play was very informative and offered a great conclusion to the day. We ended the day with dinner at the Hard Rock Café, enjoying some American style burger (veggie) and fries. And as we were getting ready to leave the waiters brought out a birthday dessert for someone, I was very excited to sing along with everyone until I realized that the students ordered the candle lit ice cream and brownie goblet for me. They knew it would make my day, and it did. I can’t wait to spend another 4 days with these guys! We woke up this morning, enjoyed our coffee and croissants and began our day. 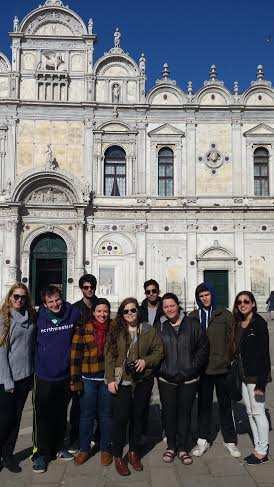 We headed to Doge’s Palace, the home of the Doge of Venice, or head of the Republic of Venice. 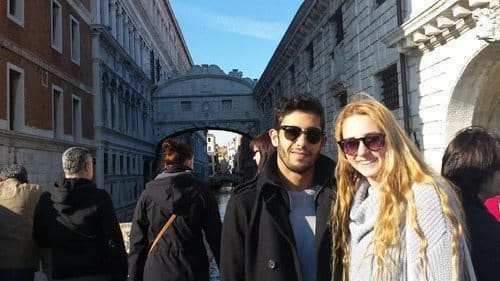 We walked through the long corridors and majestic rooms but, our main goal was to find the Bridge of Sighs. Our guide the day earlier had taught us that the name of the bridge has no romantic roots, rather it is the sigh one sighs when seeing the last beautiful landscape before you are marched off to prison or execution. 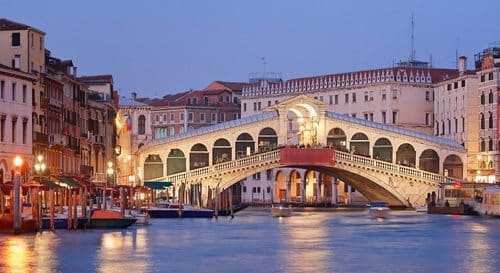 This was the bridge that connected Doge’s Palace and the interrogation rooms to the new prison. And as we took in the site, we sighed as well. After everyone had a chance to buy some last minute gifts we headed back to our hotel to pick up our luggage and make our way to the train station. We were off to Florence! 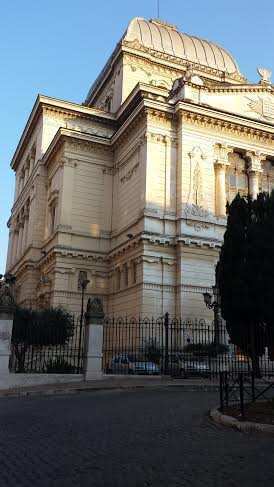 Upon arriving in Florence we quickly dropped off our luggage and headed over to the Great Synagogue located about 15 minutes’ walk from our hotel. Unfortunately no cameras were allowed in because it was beautiful! The students didn’t really see it coming, but the second they walked in they were shocked by the size and beauty of this still functioning Synagogue. The next stop was back to the hotel for some down time before our next activity. On the way we walked through San Lorenzo’s open market place and we took a short detour to do some quick shopping. Tonight we went on a Dark Heart of Florence tour starting at 8:00 PM with our guide, Frederica (yes, second tour guide, second tour guide named Frederica). We visited a number of castles and plazas as we learned about Florence’s dark historical past. The tour came with some great photo opts and delicious gelato! We ended the night with some Italian pasta and wine. Five round trip trains, three villages, two cities and 13 hours later. Today was a blast! We started the day a bit earlier than usual, and we were on the 8:28 a.m. train to La Spezia. Fortunately our hotel is conveniently located around the corner from the train station. We were off to Cinque Terra, a portion of the Italian Riviera, for the day. Cinque Terre, or “The Five Lands” are comprised of the following villages; Monterosso al Mare, Vernazza, Corniglia, Manarola, and Riomaggiore. We were able to visit three out of five, Moterosso, Vernazza and Manarola. We were led by a local tour guide, Margarita or Maggie for short. Maggie took us through these beautiful villages while talking to us about the history of the region. 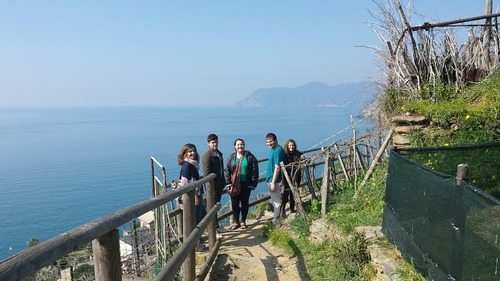 We enjoyed a short hike through the vineyards of Vernazza and a gourmet lunch in Manarola. It was beautiful, education and we all had a fantastic time. 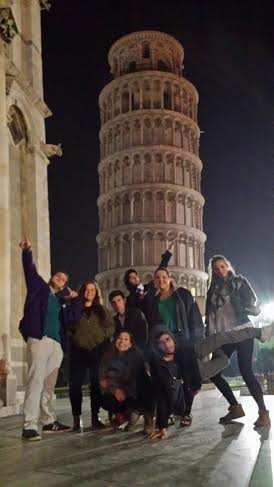 On the way back to Florence we made a quick(ish) stop in Pisa for photo shoot by the Leaning Tower of Pisa. 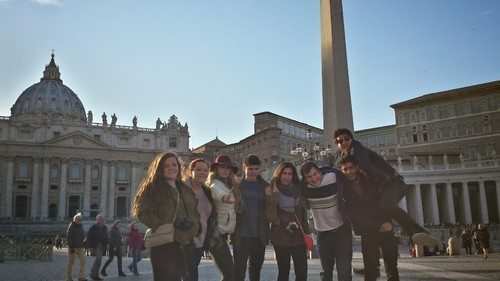 Today was great, we went from Florence to Rome and visited some important sites in both cities. We started the day at 9:00 am and departed the hotel headed for the Gallery of the Academy. This is the museum that houses the original David. When we arrived the students got a very anxious, it seemed the line was around the block. But we come prepared and after visiting the ticket office we were able to cut the entire line. Seeing Michelangelo’s David statue is an extraordinary experience, and although museums can sometimes be daunting I don’t think anyone expected the statue to be as tall and prominent as this was. Everyone knew that after visiting this museum we would have our last free hour in Florence. Knowing that some students had already decided to do a quick tour of the museum and spend as much time shopping as they needed or wanted. 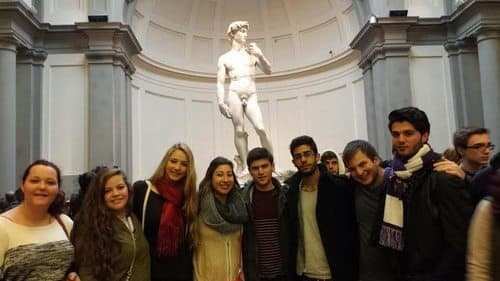 But nonetheless some of the students, after seeing the David, realized the importance and value there was to staying a little bit longer. One of them David Tahari, sometimes it’s hard to remember but the items we bring our students to visit we do for a reason. And everyone enjoyed your last hour shopping time in Florence. Kira, Abby and I decided to visit the central market in order to prepare a picnic for the train to Rome. Kira and Abby helped find some yummy cheeses fruit and pizzas for lunch on the train. After seeing the selection of food on the train when we traveled from Venice to Florence I thought this would be a bit more enjoyable. To everyone’s surprise we had reserved business class seats on the train from Florence to Rome, needless to say the students are very excited and for the hour and a half train ride the students slept like babies. 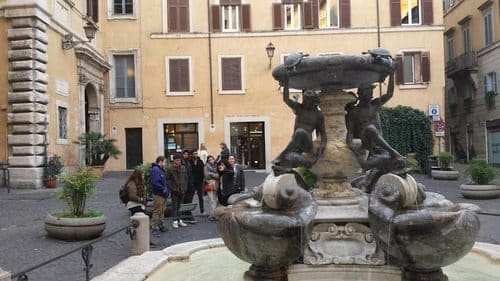 We arrived in Rome and thankfully it was much warmer than it had been over the last few days.. so instead of finding a bus to take us to our hotel we strolled down Via Nationale one of Rome’s main streets to find our hotel. After quickly freshening up some of the students and I decided to leave early for a tour of the Jewish Museum in order to check out some of the other cool sites in the neighborhood. We made our way to the Trevi Fountain, which is currently under construction. Sam led us to the Spanish Steps and we race to the top in time to take a few pictures before we had to head over to the Jewish Museum to meet our guide. Sara, our guide, is a local Jewish Italian, who went through the main synagogue as well as the Jewish ghetto. 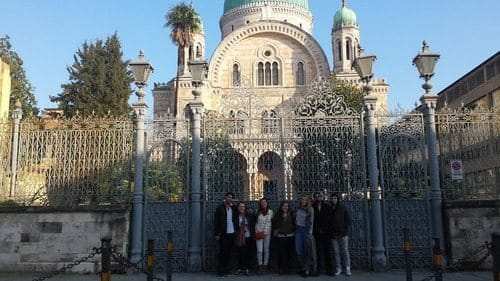 For two hours Sara explained to us the history of the Italian Jews throughout history. 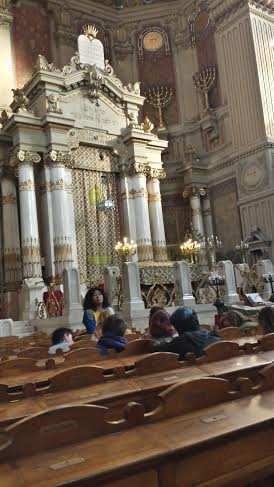 The synagogue is a true masterpiece, although Natan believes that the Florence synagogue is prettier we all recognized that the Roman synagogue is definitely larger. 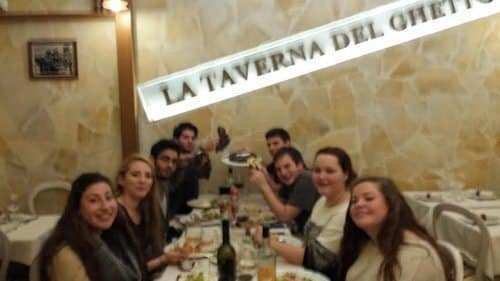 We ended tonight with a delicious dinner at a local kosher restaurant called Taverna Del A’ghetto. Thursday, is it really only 24 hours ago? 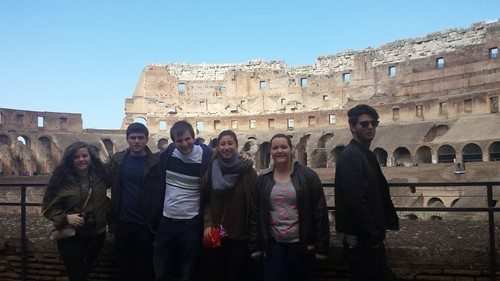 What a great way to finish off our time in Italy, visiting many of the famous sites in Rome. We started the morning with a visit to the Israeli Embassy and met with Israeli Minister of Public Diplomacy in Rome, Rafael Erdreich. The minister spoke to us about the relationship between Israel and Europe on a whole and then continued to discuss the specifics about Italy. 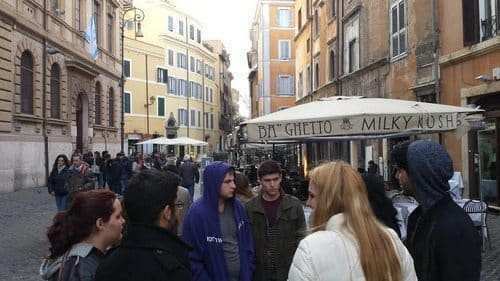 We learned that although there are only 30,000 Jews living in Italy and half of them live in Rome they are respected by the government. One of the things he focuses on in Italy is Israeli advocacy work, trying to combat anti-Semitism or antizionism with education. One thing that stood out to us was when he said this ‘there is no cure for Anti-Semitism, what we can do is educate ourselves.’ After a few questions from the students he encouraged us to use social media to further educate the world about Israel. He implored us to share articles and different posts about Israel which will help shed a more positive light on Israel. It was a great visit but, due to security at the embassy I was not able to take a picture of my own (their staff should be sending me one soon). Right before we left I asked the Minister if he knew any other Ambassadors from Israel, particularly any Govrins. With a huge smile he told us that he plays basketball with David Govrin when he lives in Israel, David is the father of Tomer, one of our Jerusalem counselors. Our small world only continues to get smaller. 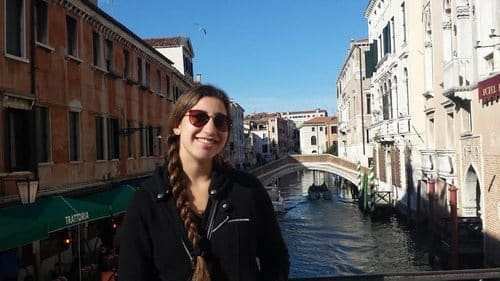 After this visit we walked through the Villa Borghese garden to get from the Israeli Embassy to the Metro station that took us to the Coliseum and Roman Ruins. Before taking the metro we walked into Piazza del Popolo, a very busy public square, which offered some great photo opts! We got to the Coliseum with about two hours to walk around and take in the sites. We all took turns sharing fun facts about the history we were seeing. Sam was very excited to see the Arch of Titus and he explained to us the reason there is a scene of soldiers carrying the Menorah from our Holy Temple included in the arch’s décor. The arch was built to honor Titus’s many achievements, one of which being the successful siege he put around Jerusalem which concluded with the destruction of the second Temple. 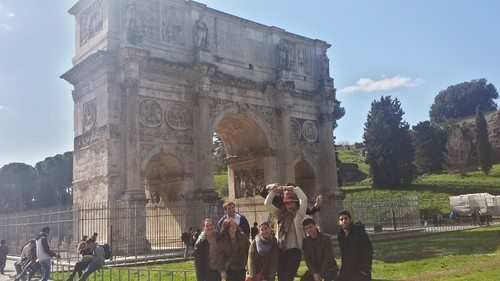 You can always tell when something seems interesting to the group; all of them take pictures and many pictures were taken of The Arch of Titus. After spending a couple hours taking in the enormity of the different structures in the park we were on the way to Vatican City. As we were walking to the Metro we overheard a group of young girls all wearing the same shirt speaking Hebrew. 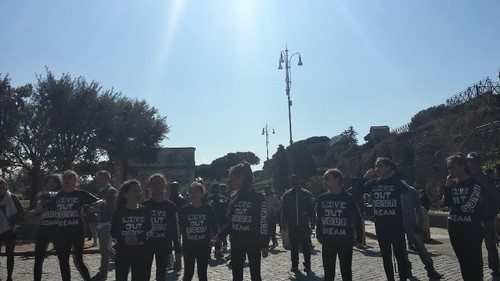 Needless to say we stopped to chat with the group, it turned out they were a dance group from Ranana who come to Rome for four days to participate in a competition. We had so much fun talking with them they decided to show us one of their dance routines right in the middle of the entrance to the Coliseum. It was fantastic! After wishing them luck with their competition we made our way to Vatican City. 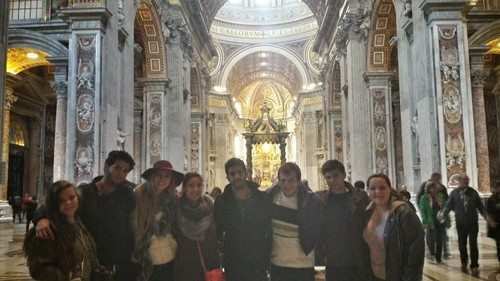 Our tour in the Vatican was not your average tour. We were going to see the Vatican, and the Sistine Chapel through the Jewish lens. Michelangelo’s Sistine Chapel is a masterpiece of scenes from both the Old and New Testament. Marco, our guide who lives part time in Israel and part time in Italy, focuses his tours on seeing the Jewish themes throughout the Chapel in the scenes from both Testaments. Some of the theories he spoke about came from a book called The Sistine Secrets, which focuses on the hidden themes throughout the paintings. One example he shared with us is that the measurements of the room are the same as those in the Talmud that teach us the proper way to build Solomon’s Palace. Or that in one of the scenes, although it is hard to see without binoculars, there are two letters written in Hebrew. He also shared the original history about the Vatican, prior to the discovery of the Jewish symbolism. The students really enjoyed the tour and enjoyed the different perspective as well. After visiting Vatican City we had about two hours before we had to head to the airport, so we walked together to find some gelato one last time. A great way to end a great trip. Upon arriving at the airport the students began asking about the Top Tourist pick. I know that usually the group finds out before arriving in Israel, but I had a plan. My plan was to eliminate the students one by one and as they are eliminated I was going to fill up taxis and send the eliminated home until I had the last two students, unfortunately due to some of the students end destination I had to change the plan. So as we exited Ben Gurion Airport I asked everyone to stand together to begin elimination. 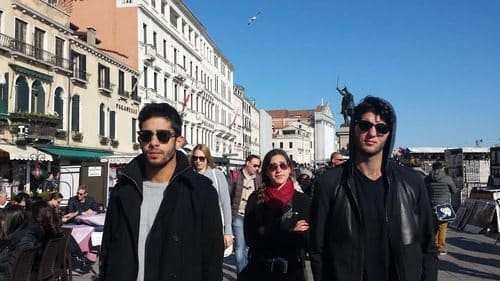 David Tahari, Gil Dubin and LeeTal Shefet, please step forward: Although you have made the most of your time in Italy the three of you have been late to about 80% of our meeting times. You may step back. Natan Tauber, please step forward: You have been an active participant in almost all of our meetings and tours but whenever we arrived at any location whether it be hotel, restaurant, café or museum you have asked for WiFi. You may take a step back. Sam Feldstein, please step forward: You have been helpful with directions and caught my embarrassing mistake in my last update email but you missed an activity in Florence and reread my embarrassing mistake over 5 times throughout the day. You may take a step back. Yarden Shuminer, please step forward: You are in almost every picture I take, which means you have participated in everything that we do and are happy to do it however, it seems Italy is against you. Your phone fell in the Venice Canal, your purse broke on the first day and you stained your only pair of jeans as well. You may take a step back. Kira Oudmayer and Abby Kaplan, please step forward: Abby, you have come on time to all activities (except that one train you had to run to catch). You started smiling in pictures on Day 1 and on Day 2 you voluntarily came into one of my pictures. Kira, you have also come on time to all activities. You allowed me to use your fancy camera for some night time shots of different activities. However, you did not speak up loud enough on the Metro, allowing us to think you did not make it on, forcing the rest of us to get off and find you. Only to see you pass us by as the metro left the station. Next time, speak up. You may take a step back. CONGRATULATIONS Abby Kaplan! 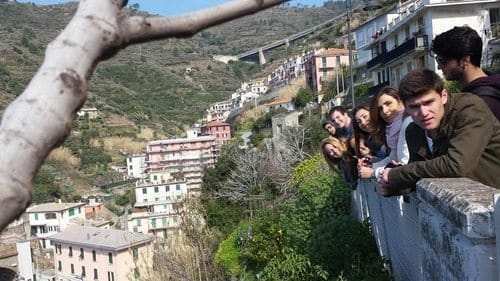 You are Italy’s Top Tourist!